It’s been three years since Jürgen Klopp was appointed Liverpool manager. October 8, 2015 was the start of a revolution that has led the club back to where it’s supposed to be, fighting for titles both domestically and internationally. But while Klopp has turned the club into challengers, is he holding them back from becoming champions with his own stubbornness? The Reds had been victims of mediocre results, mediocre football, and mediocre managers ever since Rafael Benítez left the club in 2010. The start of the decade saw Liverpool finish outside the top four in six out of seven consecutive seasons. However, thanks to Klopp, Liverpool is back where they belong: the top, or at least close to it. Back-to-back top four finishes, alongside a run to the Champions League Final, has been followed by a promising start to the season. Liverpool have kept Manchester City’s title challenge at bay, staying just two points behind, and with five goals conceded over the first 13 matches of the league season. The German has produced mesmerizing attacking football, and now, with the arrival of Virgil Van Dijk and the progression of Joe Gomez, has solidified the defense. Klopp has demonstrated a clear plan on all fronts in order to challenge for trophies; from tactical, training, transfer, and mentality standpoints. Paradoxically, though, it’s evoked a new question mark surrounding Klopp, a hiccup in the honeymoon: is his own steadfast belief in his plans hurting the team? Talking stubbornness, there are two main areas that are relevant – transfers and team selections. Starting with transfers, or non-transfers, the two most appropriate examples are Virgil Van Dijk and Nabil Fekir, who were the club’s main objectives throughout the summers of 2017 and 2018, respectively. As the club failed to close either deal, and Klopp refused to sign a plan B, they were left without solid alternatives in the positions, positions that would come to be massive weaknesses for the club during the first half of each season. A void in 2017 of a solid centre back, and in 2018, that of a creative midfielder filling Philippe Coutinho’s role of breaking down defenses. It’s been a successful start to the season. Liverpool are keeping up with, what may very well be, the greatest Premier League of all time, and while they are third in their Champions League group, they have the manpower to get the result they need against Carlo Ancelotti’s Napoli at Anfield. Results keep going in Liverpool’s favor, but on the pitch, in terms of performances across the 90 minutes, there’s a different story being told: a sharp decrease in offensive quality. What was once an unstoppable, electric front three of Mohamed Salah, Sadio Mané and Roberto Firmino, an unmatched, invincible attacking trio that carried Liverpool to the final in Kiev, is now a disjointed triad that’s punching well below its weight. But a more substantial part of the problem has been the lack of delivery, inefficiency and instability from the midfield – which additionally has left the front three, especially Roberto Firmino, with an unfeasible creative workload. Despite the decreasing quality in the team’s performances, the go-to midfield, that which saw Liverpool through past Roma and Manchester City in the Champions League, and that contested Real Madrid in the final, remains a constant. Jordan Henderson, Georginio Wijnaldum and James Milner. A hard-working midfield, but not the most capable when it comes to being a creative force for the front three. It’s a midfield composed of workhorses who can defend space with relentless running and mount intense pressure – nothing more, nothing less. It is an unbalanced midfield filled with the same profile over and over again. A sound midfield should be able to conduct that high pressure (as that’s a cornerstone to the gegenpressing system Klopp uses), be a creative source for the offense, and be a shield for the defense. A tactically astute midfield utilizes all three midfield profiles, not just one. Currently, the midfield does a decent job shielding the defense, but a substandard job creating for the offense. It wasn’t always like this. Coutinho acted as the perfect link between the midfield and the front three last season, and when he left, Alex Oxlade-Chamberlain took his place. Both of these players are attacking midfielders by default, yet they played in the midfield three. It worked, because of what their unique profiles offered in terms of midfield balance. This very same “unconditional faith” was given to Dejan Lovren and Joél Matip last season before Virgil Van Dijk joined mid-season. And it costed Liverpool greatly, bestowing upon them one of the shakiest defenses in the Premier League. From a long-term standpoint, it was wise to slowly introduce Fabinho to the league and let him acclimatize properly, and Naby Keïta – who is familiar to the system and the nature of the league from his time in the Bundesliga – has unfortunately been sidetracked with injuries. However, what doesn’t make sense, and what has no excuse is Klopp’s hesitance to start Xherdan Shaqiri. The Swiss international has taken every opportunity that has been given to him and has produced two goals and two assists in 380 minutes in the league. And still, those stats don’t fully reflect the impact he’s had on the pitch. Shaqiri has brought and meant unpredictability – breaking the pattern of the front three this season – a fresh injection of creativity and hard work, immense work rate. Even though he may not be of the same echelon as Coutinho and Fekir, he’s always delivered when given the opportunity. As a Liverpool fan, I wouldn’t want anyone else other than Jürgen Klopp managing Liverpool Football Club. However, change is not something that’s bad – it’s something that’s needed. Every great manager adapts winning formulas if they’ve proven to be outdated and stagnant. Just take a look at the two top-ranked teams in Group C, who have beaten Liverpool over the past two encounters, and who pose the threat of advancing to the Champions League knockout round and knocking the defending finalists out of the competition. Maurizio Sarri developed a winning formula during his time at Napoli, challenging Juventus for the title while playing some of the prettiest football Serie A has seen. However, with just a month into the job, Carlo Ancelotti terminated his predecessor’s iconic 4-3-3, which his players had become accommodated to, and instead, adjusted to a 4-4-2. It’s proven to have gotten the best out of Napoli, both in terms of results and performances; Napoli remain second in the table, yet first in their Champions League group. Furthermore, while his predecessor was hesitant to change up his tried and trusted starting line-up, Ancelotti has chopped and changed his teams, getting the most out of a large, talented squad. Thomas Tuchel, on the other hand, took the mantle from Unai Emery, who just last season, had won the domestic treble at PSG, and immediately changed the formula. While Emery preferred a 4-3-3, Tuchel was forced to change this up, mainly due to PSG’s defensive issues, its lethargic midfield, and the exit of Thiago Motta without a like-for-like replacement. In change, he has often used a three-man defense, with a double pivot of Marco Verratti and Julian Draxler, and with wing-backs pushing up to combine with attack. However, even this new line-up isn’t always set in stone, as we saw on Wednesday at the Parc de Princes. PSG shifted between a 3-4-3, a 4-2-3-1, and a 4-4-2 throughout the match. Marquinhos would move from defensive midfield to center back depending on the situation, while Neymar would move from a winger to a free role in attack to a left-sided midfielder focusing on shutting down attacks down Liverpool’s right flank. PSG began on the front foot, operating in a 3-4-3, which saw Juan Bernat and Thilo Kehrer push forward, causing Trent-Alexander Arnold and Andrew Robertson to retreat from their normally advanced positions. The Parisians scored two early goals, and Liverpool failed to overturn the deficit. With elimination on the line, Thomas Tuchel flipped the script on his compatriot and BVB predecessor, and he won this time. As a manager, you must not only adapt tactics when necessary, but you must also use your squad to the fullest of its abilities. The midfield constellation of Henderson, Milner and Wijnaldum doesn’t provide enough creativity and balance, whereas Shaqiri, Fabinho and Keïta are ready-made solutions that do. That midfield trio did well to heroically fight past the latter rounds of the Champions League knockout round, at a time when, with the injuries of Adam Lallana, Emre Can, and Oxlade-Chamberlain, they had no possible replacements. Back then, Klopp didn’t have any alternatives whatsoever, he literally could not choose a different midfield if he tried. Now though, with a brand-new midfield trio waiting to be harnessed, he has no excuses. And yet, Liverpool fans have seen its team resort to the same midfield as yesteryear. It’s as if Klopp bought a Ferrari, a Lamborghini, and a Bentley, yet still decides to take the broken-down Chevy into work every day. It’s one thing to believe in your players, but when it comes to the point where you make one-dimensional team selections and refuse to sign desperately needed back-up plans, that belief starts to harm the team’s chances of winning. Sometimes, feelings will get hurt and money will get spent. Sometimes, things must be done for the greater good of the team. 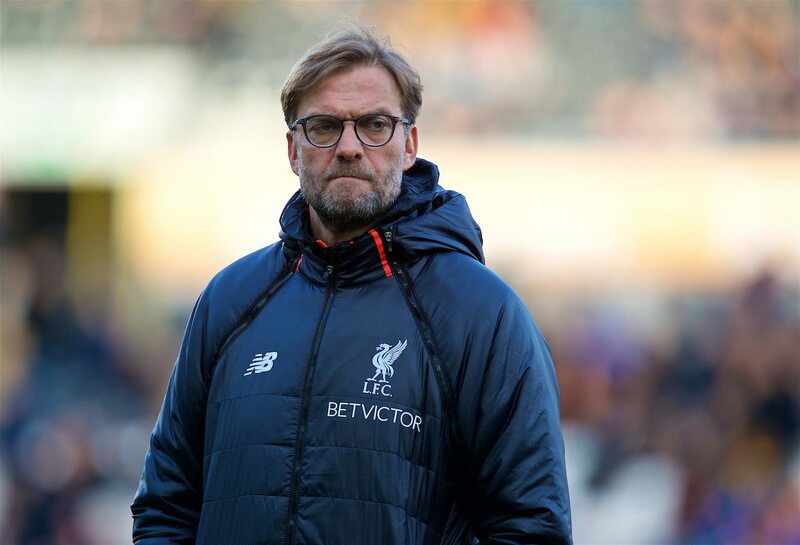 It is a statement to the turnaround Klopp has engendered at Anfield that Liverpool fans have the luxury to analyze the quality of the team’s performances – while (so far) getting the results on our side. Not too long ago, Liverpool fans were worried about getting past Braga and Beşiktaş in the Europa League. Now, they’re worried about getting past Napoli and PSG in the Champions League. Nonetheless, such a miraculous turnaround does not mean Klopp is immune from criticism. More can be done, and more must be done, if Liverpool are to end their title drought this season.